Gas prices nationwide have gone up 3 cents in just three days. 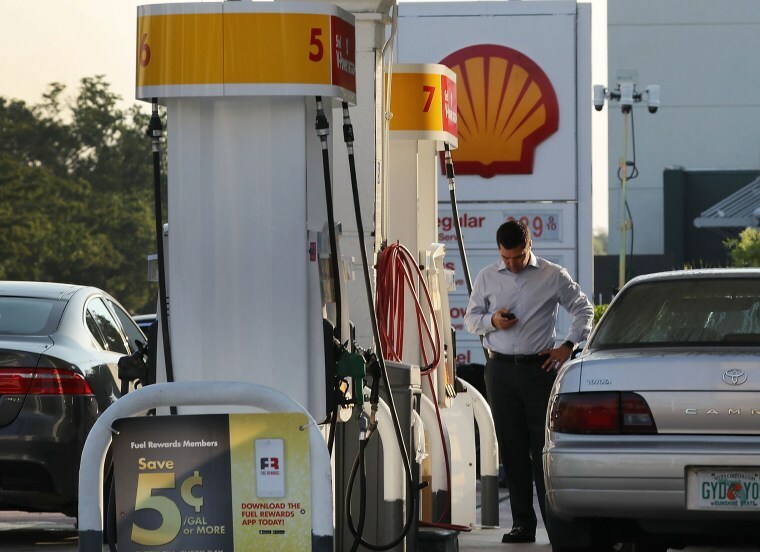 Americans are paying more at the pump these days, and energy analysts say we should expect to keep digging deeper into our pockets through spring. Gas prices, which have already risen to a nearly three-year high, are forecast to go up even further. One report even says that if per-gallon prices rise by $1.05, it would wipe out gains from last year’s tax cuts for most consumers, according to Deutsche Bank. President Donald Trump denounced the "artificially very high" price of oil on Friday in an early morning tweet, claiming that the Organization of the Petroleum Exporting Countries was "at it again" and that such behavior "will not be accepted." The Energy Information Administration had originally forecast that drivers in the United States would pay an average of $2.74 per gallon this summer for regular gasoline — but we’re already there. According to AAA spokeswoman Jeanette Casselano, gas prices nationwide on Thursday averaged $2.74 — an increase of three cents in just three days. Two primary crude-oil benchmark prices both hovered around $70 a barrel on Thursday, highs last seen in late 2014. Favorable economic conditions around the world are driving demand, as are Saudi Arabia-led production cuts, scheduled to go through the end of the year, with which members of the Organization of the Petroleum Exporting Countries and Russia — which is not an OPEC member — are complying. An OPEC committee meeting Friday is expected to evaluate the impact of the cuts so far, with some reportedly in favor of an $80 price target. Analysts say this could translate to a nationwide average high of roughly $2.80 to $2.90 a gallon for regular gasoline. A handful of states have already hit $3, and more are likely to hit that mark. Demand is forecasted to rise in the coming months, compounding the crunch. “In the United States, we’ve never seen a week where demand for gasoline has averaged over 10 million barrels a day,” Kloza said, but he estimated that we’ll likely hit that milestone by summertime. This kind of mismatch between supply and demand can cause problems. “It’s the next 150 days, and particularly that period in August and September, that is most concerning,” Kloza said, because low surplus supply could make the market extra sensitive to factors like hurricanes that can disrupt production. A low surplus supply of crude oil could make the market extra sensitive to factors like hurricanes that can disrupt production. But oil market experts also say the pain is likely to be temporary, with prices hitting their peak in the spring rather than the summer. “It changes when you get to the end of 2018. We think prices in 2019 — for crude, for gasoline — we think that prices next year will be lower,” Kloza said. This means the current price run-up is unlikely to turn into a repeat of 2008, when a peak price of $4.11 per gallon was one of the factors blamed for tipping the economy into recession. As the price of oil rises, OPEC members will be more tempted to flout the cartel’s production caps, and North American energy companies will have the incentive to increase production, said Patrick DeHaan, head of petroleum analysis at GasBuddy. “Ten years ago we didn’t have that spare capacity,” he pointed out. A business-friendly government rolling back regulations on energy producers also helps. “U.S. rig counts will continue to respond to high oil prices,” DeHaan said. In addition, Kloza said a number of new projects launched in the early part of the decade — before prices started plummeting — will begin coming online to ease the supply crunch, while on the demand side, a secular trend toward buying fewer cars along with higher mileage standards will ease demand from drivers. The wild card, most analysts agree, would be an escalation of geopolitical tensions in Syria. “Unrest in the Middle East often contributes to spikes in crude oil price in the market. We are already seeing high crude prices and Syria plays into that price going a little higher,” said the AAA’s Casselano.